Philip Glass is, for better and for worse, the world’s single most influential living composer. His mark is to be found in the music of Eno, Bowie, David Byrne, Laurie Anderson, Aphex Twin and Nico Muhly and throughout the genres of techno and post-rock. If you’re partial to Nils Frahm or Max Richter, to mention but two of a very lengthy list, you are listening to writers whose entire musical career is predicated upon the works of Philip Glass. A bold assertion that I have no hesitation in making. 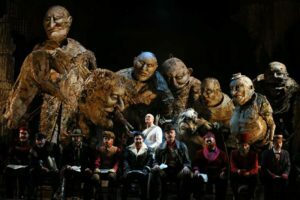 The critically acclaimed 2007 Improbable production of Philip Glass’s landmark opera Satyagraha returns for the third time to the ENO. From high up “in the cheapies” Keiron Phelan bends a critical ear. English National Opera at the London Coliseum 22/2/18. In collaboration with Improbable. 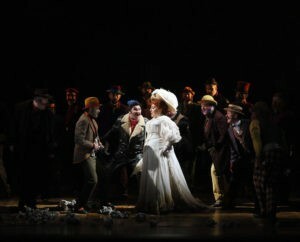 A Co-Production with the Metropolitan Opera, New York. Director: Phelim McDermott. 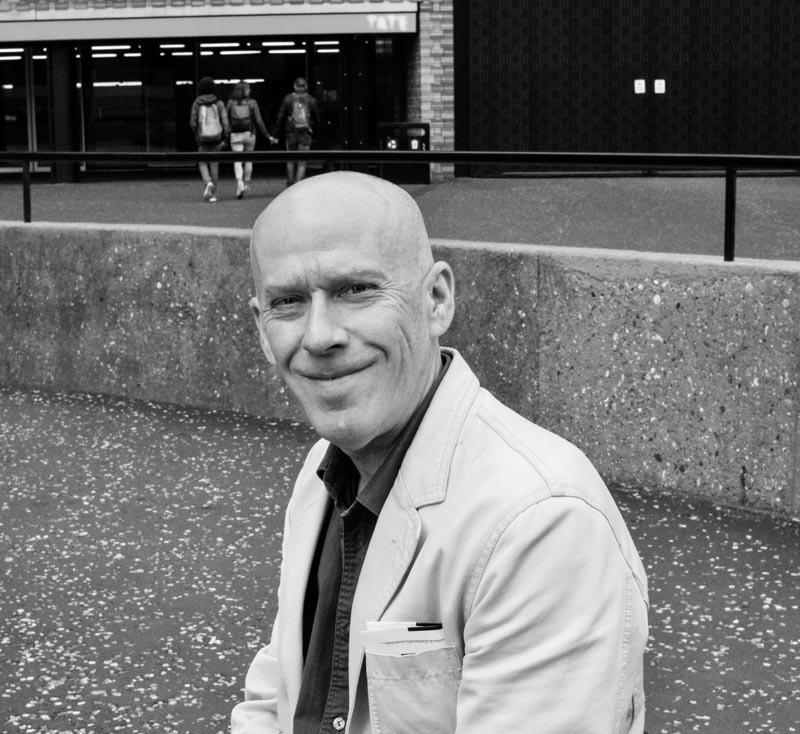 Assistant Director / Set Design: Julian Crouch. Conductor: Karen Kamensek. 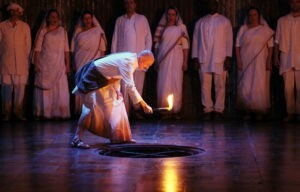 M K Gandhi: Toby Spence (Tenor). Due to an excess of pleasant but inconsequential film score work (aka Michael Nyman syndrome) Philip Glass’s reputation as a serious composer has declined somewhat in recent years in favour of the less easily distracted and arguably more talented Steve Reich. Back in 1980 however, following his groundbreakingly rigorous Music In Twelve Parts and the unquestionably innovative Einstein On The Beach, Glass was very much the Minimalist “Man” and it was in this climate that he was commissioned to compose Satyagraha. 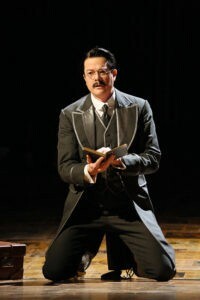 Eventually forming the centrepiece of his “personality trilogy” of Operas, alongside Einstein and the concluding Akhenaten, Satyagraha was Glass’s first exercise in traditional orchestration, if you overlook the fact that he entirely dispenses with the brass section. Not that this traditional element bleeds overmuch into the provenance of the work itself. 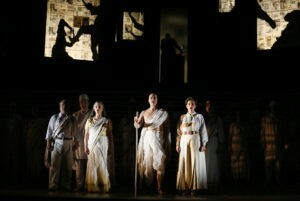 As with Einstein, the libretto to which largely consists of chanted numerals, Satyagraha is far from strictly operatic. The loosely told story is that of Mahatma Gandhi’s struggle to establish and develop his doctrine of non-violent protest during his sojourn in South Africa which, in case you were wondering, is where the big “S” word comes in (literally “truth force”). Moving on from Einstein Glass decided to have this libretto sung in Sanskrit, fortunately not as big an impediment to enjoyment as one might fear, proving to be a richly resonant language. Moreover as the libretto itself, the text of which was sourced from the Bhagavada Vita by Constance De Jong largely consists of moralistic reflections, highly worthy but prone to impart a sense of piety fatigue after a few hours, the usage of a dead language possibly does some of us a slight favour. Satyagraha’s non-chronological scenes are designed to illuminate the ideals of the doctrine rather than the specifics of Gandhi’s life and each of the three acts are informed by a spiritual guardian; alternately Tolstoy, Indian poet Tagore and Martin Luther King who each represent an aspect of the Satyagraha process, thus rendering the work into a non-narrative and stylised form. 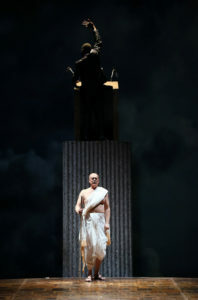 It is unsurprising, then, that much of the weight of a convincing rendition of the piece falls upon imaginative staging and imaginative it is, the set design is kept suitably Spartan, thus reinforcing the meditative nature of the text and the minimalist style of the score, but the set changes themselves create beautiful, transformative atmospheres around the central stasis of the piece. Within these parameters, great ingenuity is displayed, principally by use of the humble newspaper, suggestive of Gandhi’s poverty, and alchemised en masse by the cast into fans, screens, barriers, fountains and fluttering animalistic shapes (and sometimes even just used as newspapers). Strategic use is made of imposingly large, Gollum like papier-mache figures that, at certain crisis points, loom nightmarishly above the principal characters, representing the violence proffered by those opposing Gandhi’s cause. A particularly affecting tableau is constructed midway through Act3, where slow stepping figures stretch simple bands of tape across the entire stage creating a tranquilising, luminous web-like environment. A complete mood shift is then achieved by simple dint of the tapes being slowly cut and adeptly fashioned into a vibrating version of one of the Gollums. It could be argued that combining slowly moving performers with slowly moving musical arpeggios is, in this neck of the woods, an enormous ‘80s cliché. But, Hell, if it works this well, why change it? Happily, the musical performances are every bit the equal of the set design. 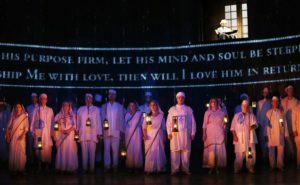 Toby Spence’s tenor (as Gandhi) leads the cast with a smooth, plaintive, graceful tone, standing out but never overwhelming his co-singers. 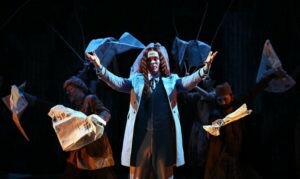 The declamatory beauty of Act 1, Scene 1’s The Kuru Field Of Justice ,which slowly evolves into a male trio and is crucial to establishing the tone of the whole performance, is a singularly well balanced affair containing the essential blend of strength and gentleness that could stand proxy to the moral of the work itself. A more contentious note is struck by the pronounced vibrato utilised by all three female leads. An unusual call as, although impressive, the vocal oscillations involved sit more awkwardly over the rapid ostinato passages of the music than purer tones might. There is, however, no doubting the quality of the chorus. Consistently precise and passionate the full chorus of Act 1 Scene 3’s The Vow concludes that section of the work with breathtaking aplomb, fair blowing the posh socks off of even those of us “up in the cheapies”. The eighteen strong male chorus of Act 2 Scene 1’s Confrontation and Rescue amplify this aspect of the work in its most hectoring and relentless section utilising an almost intimidating intensity. A particular shout-out should go to conductor Karen Kamensek whose expertise in interpreting minimalist scores is fully evident, combining both the requisite tightness and the scope for the performance to emotionally soar. Minimalism has, notoriously, been tagged as a school of composition that has failed to achieve an entirely mature phase. In 1980 Minimalist music, while not as strange a beast as it was in 1970, was still cutting edge stuff but, inevitably, the ensuing years have bred familiarity. The backing music to a thousand, serious-minded, documentaries have done for the genre what L’Oreal’s make-up graphics have done to Mondrian’s art; half neutered it. How then has the piece stood the test of time? A few shortcomings do make themselves apparent. Firstly, the piece is somewhat underwritten. This much was suspected back in the day but is now more pronouncedly noticeable. In some sections that which once seemed daringly repetitious now seems, simply, over repeated. Vocally, Satyagraha never shifts out of declamatory mode, which is to say the singers sing ‘at’ rather than ‘to’ each other. 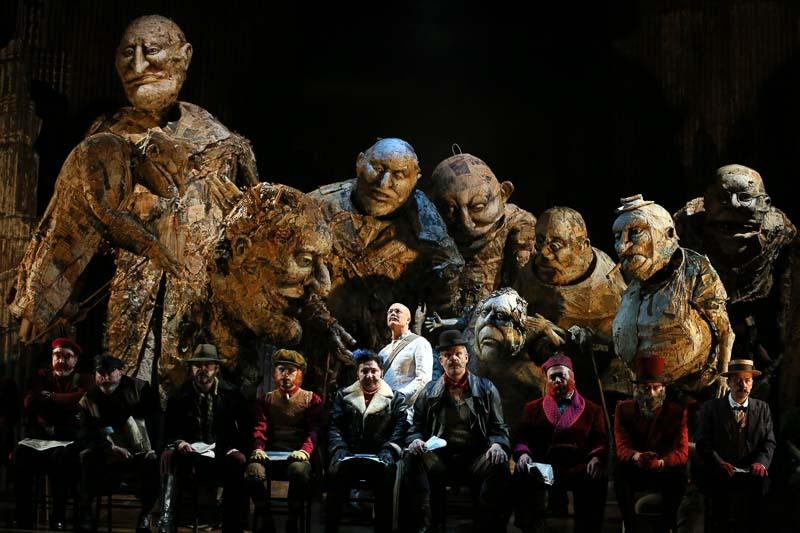 While this certainly lends an impressive aura to the opera it also has the effect of depersonalising it, possibly undermining the work’s central theme of humanism and sympathetic human interaction. There is also the issue of dynamics, or lack of. Minimalist music is something of a pig to orchestrate, as its fundamental reliance upon repeated motifs and rhythmic emphasis is more naturally suited to smaller and more percussively orientated ensembles (I’m taking the mild liberty of regarding keyboard instruments as being, essentially, of the percussive persuasion). The additive, subtractive nature of Minimalist compositions demand that any dynamic shifts be clear, noticeable ones; thus leaving the composer with fewer orchestral cards to play in terms of subtle changes of timbre (Mahler ; it’s not) and the ensuing “flattening” effect throwing considerable weight upon the primary melody lines to remain consistently and intrinsically interesting. Given his unknown track record up to this point in his career Glass proves himself a remarkably strong melodicist, revealing a Coplandesque liking for wide interval spaces during Act 2 and some shades of Gorecki throughout the largely elegiac Act 3, although it’s also in this concluding section of the work that he seems, at times, to have run out of musically inventive steam. As I suggested at the beginning; Glass may never quite have lived up to the high hopes that were entertained of him during this period. Much of his subsequent piano compositions, for example, have been exemplary, but for all of those, there’s been too much time spent on such projects as the Low Symphony; things certain to raise profile but intrinsically unlikely to accrue any true artistic weight. Lamentable as that is; Satyagraha remains a work of great emotional power and of continuing value. A tantalising pointer, perhaps, to what might have been. 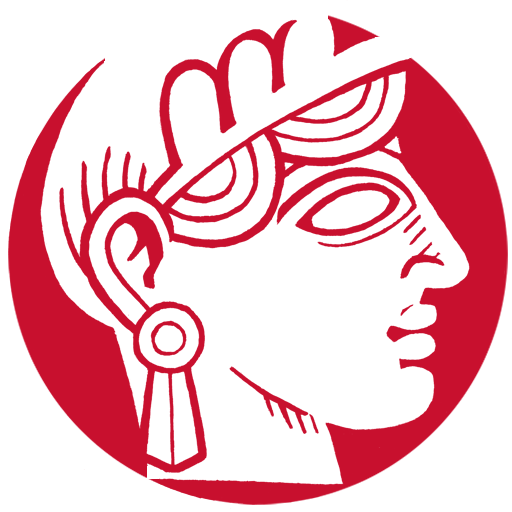 Images courtesy of ENO, © Donald Cooper.